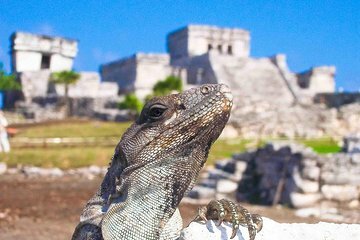 Associez aventure extrême et culture à ce tour combiné de Cancun. Survolez la canopée en tyrolienne, descendez jusqu'au sol de la jungle Maya et faites de la plongée en apnée dans un cenote. Émerveillez-vous devant les ruines de Tulum, une ville fortifiée maya perchée au sommet d'une falaise offrant une vue imprenable sur les Caraïbes. Cette excursion d'une journée complète comprend un délicieux buffet de cuisine mexicaine authentique et le transport de l'hôtel. Overall a good time. They picked us up at 730am... got to Tulum at 1045am and was there for 2 hours. Next we drove out in the middle of the jungle and then ate some very authentic mexican taco meal- it was delicious!!! We then did rappeling, zip lines, and snorkeled in an underground river/pool. Then it was back on the van and on the way home. We got back to our resort at 730pm. So really my only complaint is don't market it as an 8 hour day when it really is 12. Other than that pretty fun experience!! I really enjoyed this tour however it might have been helpful to know a couple of things. The tour guide, who seemed like a representative of the local tour company, Aventuras Maya, was the primary person giving the archaeological tour of Tulum. His tip was separate and that would have been helpful to know as I usually try and prepare my tips ahead of time so I am not fumbling around with money and trying to tip the appropriate amount. In this case I tipped a little more which I am sure he was fine with because I felt he was very knowledgeable. Also at the site where we did the Xtreme activities zip lining, repelling, and swimming there was a tip jar and I wasn't sure if we should tip there also. I decided against it and just tipped Henry, our Xtreme tour guide. I know that every place is different in terms of tipping but it would be nice if there were guidelines that would outline an acceptable amount and how many people to tip. As for the tour itself I enjoyed Tulum however if you want to spend time at the beach that will not be possible. I would recommend a little more time here so people can enjoy the beach. The Xtreme activities were fun and while I hoped to go a little faster when repelling I understand that safety is most important. This tour was amazing! Our tour guide Leilani was was great. She picked us up from our hotel on time in a clean air conditioned van. Our tour guide was amazing..he was very knowledgeable and really made you think! The zip line, rappelling and snorkeling in the underground cave was okay, great experience if it was your first time doing this. The staff at Aventuras Maya are wonderful, and Tulum is worth the trip. The snorkeling in the cenote was a great way to cool off afterwards though it's hard to think of it as snorkeling because there was not so much to see underwater. My only complaint would be that the breakfast and lunch served was not very good. I booked this trip for my daughter's bachelorette weekend. We wanted fun with a little culture intermingled. This was definitely the trip to take. Our guide was Alex Martinez Alejandro. He was AMAZING! He was very knowledgeable about the areas we visited. He was engaging AND entertaining. Tulum was breathtaking, the cenote snorkel was refreshing in Alex's terms and incredible, and the rappelling and zip lining were PHENOMENAL. There were a variety of skill sets in our group from novice to adventure freaks. Alex and the team were patient and encouraging so everyone of us enjoyed every aspect of the tour. I highly recommend this- it is perfect for all ages! !